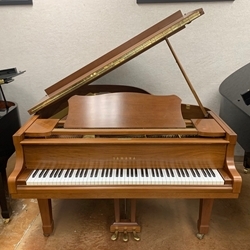 This 1977 G2 in our South showroom typifies the meticulous construction and consistent tonality for which Yamaha pianos are famous. Utilizing traditional dovetail joinery, solid maple caps and bridge, and solid spruce ribs and soundboard, this piano is built to last for generations! The beautiful satin walnut finish is a welcome departure from the typical shiny black grand.